The mitts are finished! The yarn colors do repeat, but it takes most of the ball before they do. The yarn is CPY Mini Mochi. 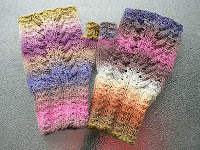 I designed these, but need to tweak the pattern before publication. They have been wear tested on this morning's dog walk. I worked on them at our library's knitting night last night and finished before bed. I was going to stay up if I had to, I was that close. Tonight, I'm doing something different. Our local movie theater has a showing of the ballet Don Quixote. DH will be out with friends, so I'm going after work. Most of the special showings of things like opera occur when I'm working, but not this time. Time to knit socks! I've had a break, now back to work. Mud season with a touch of green.